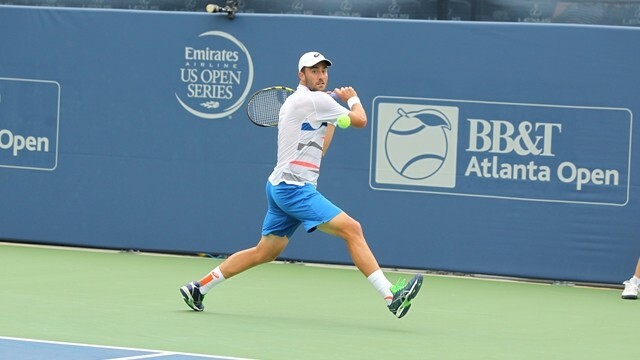 Playing four years of competitive tennis in college and then trying your hand at the professional level is an unusual route to take for the average touring pro, but for Steve Johnson, the journey has paid many dividends. Before arriving on the ATP World Tour, Johnson was a winner; plain and simple. As a member of the University of Southern California’s Trojans tennis team, Johnson helped lead his team to four straight NCAA National Team Championship titles (2009-12), while winning back-to-back National Singles titles, defeating Tennessee's Rhyne Williams in 2011 and Eric Quigley of Kentucky in 2012. After earning National Player of Year honors his final two years and closing out his collegiate career with a record 72 consecutive victories, the California native, took his winning momentum onto the pro circuit. In the summer of 2012, Johnson won first Challenger title in Aptos without dropping a set, defeating Robert Farah of Columbia, 6-3, 6-3. Entering the U.S. Open as a wild card, Johnson stormed into the third round, upsetting Ernest Gulbis in the second round before losing to No. 14 Richard Gasquet of France 6-7(4), 2-6, 3-6. The No. 4 American’s rookie year was quickly followed by a sophomore slump as he at one point lost six consecutive matches in late 2013. Last year saw Johnson become one of the most improved players on ATP World Tour after reaching his first Tour level final at the BB&T Atlanta Open in doubles with Sam Querrey, cracking the Top 50 for the first time thanks to wins over notable players such as Kevin Anderson, Tommy Haas and John Isner and finishing the year with a career-high ranking of No. 37. En route to the 2015 U.S. Open, “Stevie”, as he is commonly nicknamed, looks to finally reach the second week of a Grand Slam after making two third round appearances this year at the Australian Open falling to Kei Nishikori, 7-6(7), 1-6, 2-6, 3-6, and Roland Garros, losing to eventual champ Stan Wawrinka, 4-6, 3-6, 2-6.